"In the days since it was published, at least four gay Ugandans on the list have been attacked and many others are in hiding, according to rights activist Julian Onziema. One person named in the story had stones thrown at his house by neighbors. 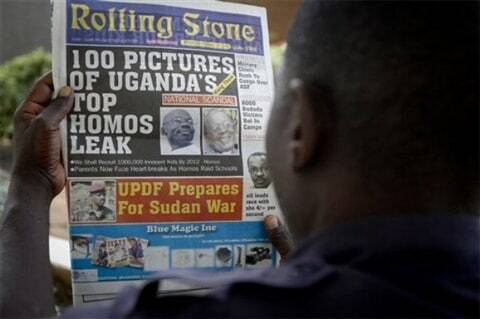 The Oct. 9 article in a Ugandan newspaper called Rolling Stone – not the American magazine – came out five days before the one-year anniversary of the controversial ("kill the gays") legislation. The article claimed that an unknown but deadly disease was attacking homosexuals in Uganda, and said that gays were recruiting 1 million children by raiding schools, a common smear used in Uganda. After the newspaper hit the streets, the government Media Council ordered the newspaper to cease publishing – not because of the newspaper's content, but rather that the newspaper had not registered with the government. After it completes the paperwork, Rolling Stone will be free to publish again, said Paul Mukasa, secretary of the Media Council. The paper's managing editor, Giles Muhame, said the article was "in the public interest." The "kill the gays" bill introduced by MP David Bahati is said to have been "quietly shelved" but the animus toward gays, it appears, is still very active.